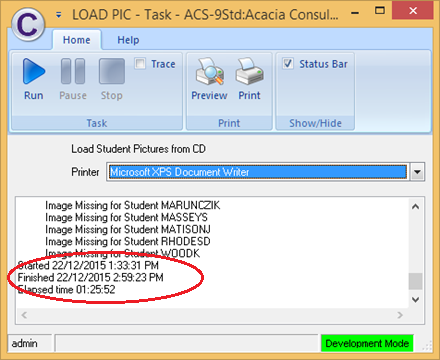 This process assumes that the photo files are named using student keys e.g. SMITHJ01.jpg and that the files are in one folder i.e. not in sub folders. Make sure that the file size of these photos is not excessive; typically each file would be less than 50KB. Importing photos larger than this may cause performance issues in the normal running of Maze. For the technically minded, Civica recommends “that photos are scanned at 72 dpi (dots per inch) to produce a bitmap about 5.2cm by 3.8cm. Save the bitmap as a 24 bit jpg image. This produces a reasonably sized image that looks good on the screen.” Your photographers should be able to provide suitably sized photos for your use. 1. Go to Database Management | Tasks | Create and Update Records. 4. You will receive the following prompts. 5. Enter the File Type e.g. JPG, BMP etc. 7. Enter in your first roll group of the required range (the roll group that appears is not necessarily your roll group). You can check the range of your Roll Groups via Student and Families | Special School Groups | Maintain Roll Groups | Roll Groups (KGC11001) or List of Roll Groups (KGC21001). 8. Enter in your last roll group of the required range (the roll group that appears is not necessarily your roll group). You can check the range of your Roll Groups via Student and Families | Special School Groups | Maintain Roll Groups | Roll Groups (KGC11001) or List of Roll Groups (KGC21001). 10. The Task window will show the task’s progress. 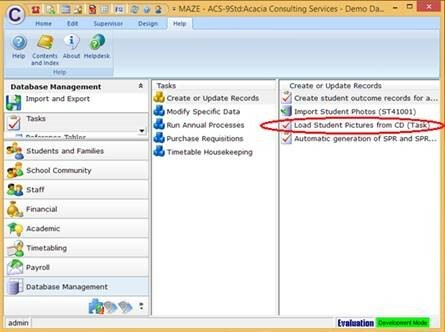 It will search in the designated directory for an image file for every student record in the selected Roll Group range. You will get the message “Student …. 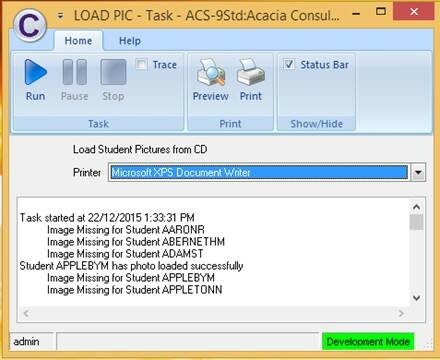 has photo loaded successfully” for each image file found and you may also get the message “Image Missing for Student ….”; this simply means that no image file could be found for that student and is not uncommon to see this message. 11. 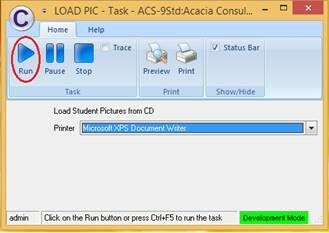 The Task window will show the Started, Finished and Elapsed times when completed. 12. Make sure to close the screen by clicking on the X in the top right hand corner of the window before continuing on in Maze.